Everyday in Los Angeles, thousands of people are working to make the city a better place and improve the lives of their fellow Angelenos. 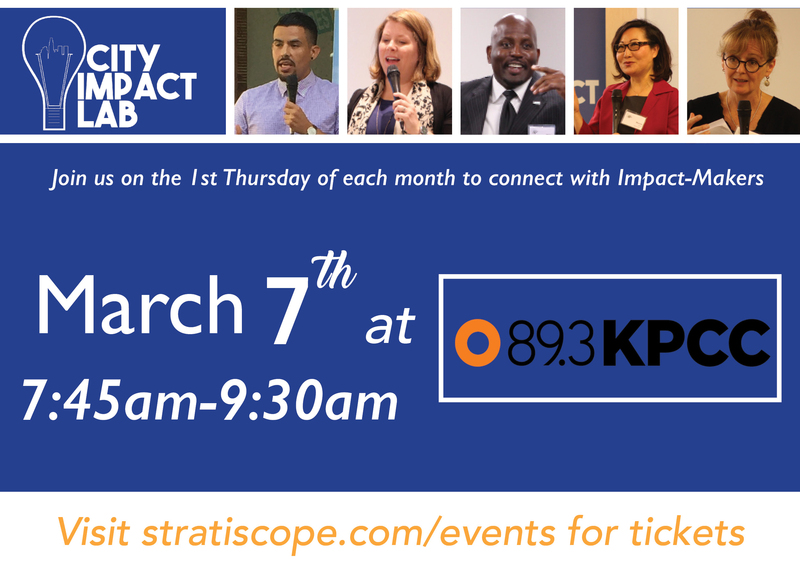 City Impact Lab, a monthly breakfast program, supports this community of impact makers from governments, the arts, neighborhoods, nonprofits, and businesses by jump starting their days with inspiring stories and tactics for success. The 90-minute breakfast is designed to provide attendees an opportunity to connect with others who can support their work, learn tactics from expert impact-makers, and find ways to more effectively create social impact in LA. Each breakfast features two noted civic, business, and/or community leaders who share their personal experiences and the strategies that have led to their success. Space is limited to 35 attendees to create a deliberately intimate experience for those who attend. Check out snapshots from previous City Impact Labs on our blog page.